The SJR way of updating the page. Simple enough, but not very extendable. Using SJRs to add sprinkles of interactivity has a low barrier to entry, and is often a great solution. But once the complexity of the action increases, SJRs quickly become bloated with conditional logic. For instance, you might want to perform different updates to the frontend depending on the page that you are creating the comment from, or maybe you have multiple comment areas on a single page that need to be updated. All of a sudden your SJR is not two or three lines, but a mess of complex code handling all of these different scenarios. When things get this complex we need a framework to organize the frontend logic—enter Stimulus. For those that know a bit of Stimulus, or have read the Stimulus Handbook, the obvious way to do this is to render the textarea and a button, attach a click event action to the submit button, and finally initiate an ajax call from within your Stimulus controller using jQuery or fetchto grab the new comment html to be appended. This seems reasonable, but it also means you lose all of the awesome ujs goodness that makes ajax so easy in Rails. Wouldn’t it be nice to still use a remote form and offload the ajax call to rails-ujs like we normally do? 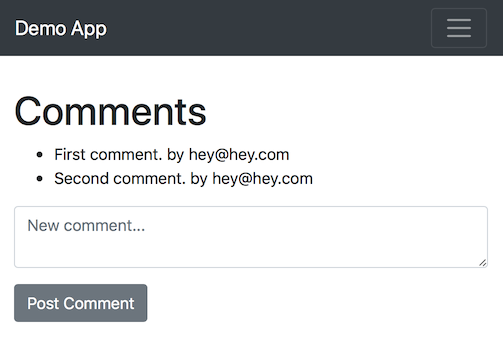 Our comments page which renders a list of comments and a form to add new comments. Our comment list is fairly straightforward. We add the Stimulus data-controller attribute to the container, as well as a data-target to the list itself. We use form_with which defaults to remote: true. In our data attributes on the form we specify type: "html" and action: "ajax:success->comment-list#onPostSuccess. This connects the form submission ajax request performed by rails-ujs to our Stimulus controller action. Software developer at Beezwax Datatools and former researcher in Physics & Neuroscience. Computational thoughts on an array of subjects.